Trim lamb of fat. Cut slits about 1/2" deep all over lamb and insert slivers of garlic. Rub all over with olive oil. 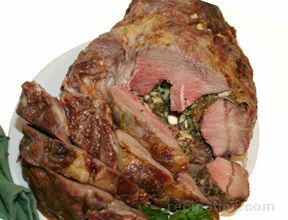 Combine salt, pepper, and herbs and rub herb mixture all over lamb. 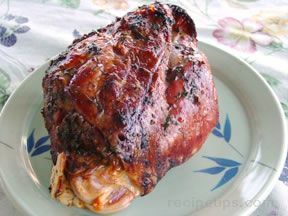 Allow lamb to sit at room temperature 20 minutes. Roast lamb for 15 minutes at 450 degrees. Turm oven down to 350 degrees. 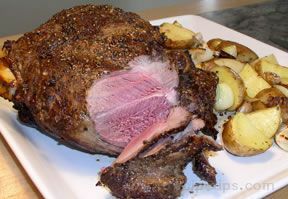 Continue to roast until desired degree of doneness is reached: about 1 hour for medium rare. Baste with pan juices once or twice. Remove from pan and allow to rest at room temperature for 15-20 minutes before carving. NOTE: Potatoes, carrots, and onions may be roasted in pan with lamb.